The carbon footprint of paper cement sacks is 2.5 times smaller than the carbon footprint of form-fill-seal (FFS) polyethylene cement sacks. This is the outcome of a comparative study by the Swedish research institute RISE on behalf of the European Paper Sack Research Group (ESG), a collaboration between Cepi Eurokraft and Eurosac. It also concludes that the paper cement sack is more climate-friendly and energy efficient. 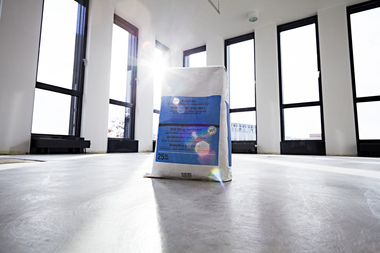 The study by RISE compared the life cycle inventories (LCI) of a typical European 25 kg cement paper sack with a typical European 25 kg FFS polyethylene cement sack. It focused on different environmental influences of both packaging solutions: overall carbon footprint and fossil energy consumption as indicators of climate change and other environmental parameters, namely emissions to air and to freshwater. The study was peer-reviewed by Intertek. Its key result concerning climate change – the most important challenge of our planet today – was that the paper sack is clearly the favourable option. 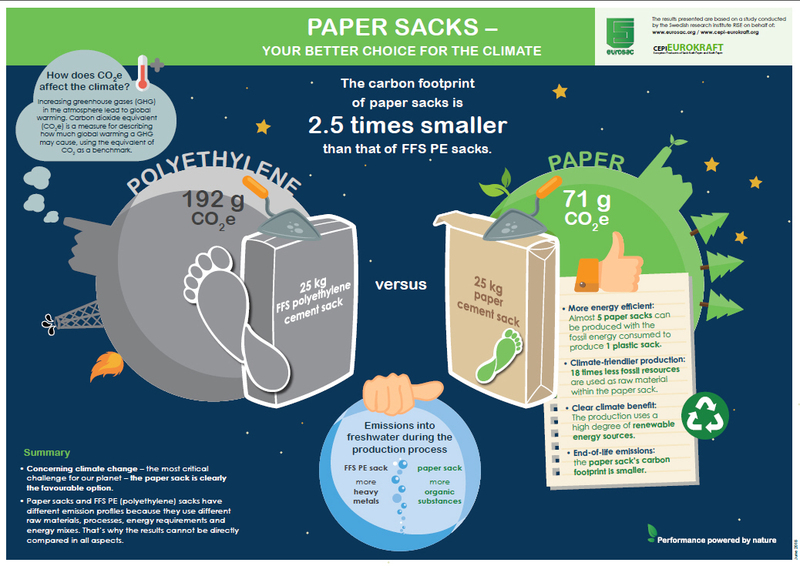 With 71 g of carbon dioxide equivalents (CO2e) emissions from cradle to gate, the carbon footprint of paper sacks is 2.5 times smaller than the footprint of plastic sacks which totals 192 g CO2e. The higher amount of fossil CO2e from the plastic sack is comparable to the emissions of a laptop (with a power consumption of 25 W) running for nine hours . Also, when extending the boundaries to consider the end-of-life scenarios – whether landfill, incineration or recycling – the paper sack’s carbon footprint is smaller. 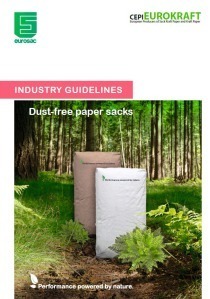 Regarding the consumption of fossil energy in the production process, the study concludes that the paper sack is the more climate-friendly solution. 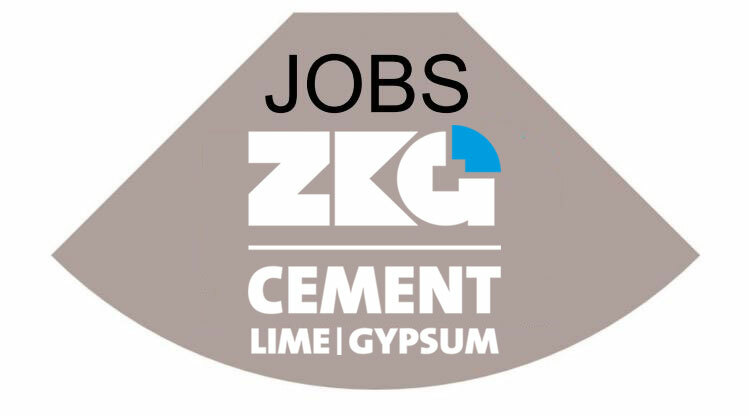 The production of a cement plastic sack uses 4.72 MJ of fossil energy per sack as fuel input. This is approximately five times more as is consumed to produce a cement paper sack (0.97 MJ of fossil energy/sack). That means, one can produce almost five paper sacks with the same amount of fossil energy consumed to produce only one plastic sack. The study shows that the paper sack system uses more renewable energy sources (0.19 MJ of renewable energy/sack) to fulfil its production energy needs compared to the plastic sack (0 MJ of renewable energy/sack). In terms of fossil resources used as raw material within the sack, the paper sack uses even 18 times less fossil resources (0.18 MJ of fossil energy/sack) compared to the plastic sack (3.19 MJ of fossil energy/sack). When looking at the study results of other emissions to air and emissions to freshwater during the production process, a conclusion as to which of the two packaging choices is better for the environment cannot be drawn. Paper sacks and FFS polyethylene sacks have different emission profiles because they use different raw materials, processes and energy mixes and have different energy requirements. In some respects, the paper sack shows better results, in others it is the plastic sack. One example: Regarding the emissions into freshwater, the cement plastic sack emits more heavy metals whereas the cement paper sack emits more organic substances. The regularly conducted carbon footprint analysis by RISE of the value chain of an average European paper sack also shows a convincing outcome: alone between 2007 and 2015, the CO2e emissions have improved by 22 %, exceeding one of the EU climate targets for 2020 five years prior to this date, namely that of reducing greenhouse gas emissions by 20 % compared with 1990.